There’s no Plan B for a state-corporate form of central-planning capitalism that is no longer functioning. If there is one reality that is denied or obscured by the Status Quo, it is that the economy no longer works as it did in the past. This is the fundamental economic context of our current slide into political-social disintegration. 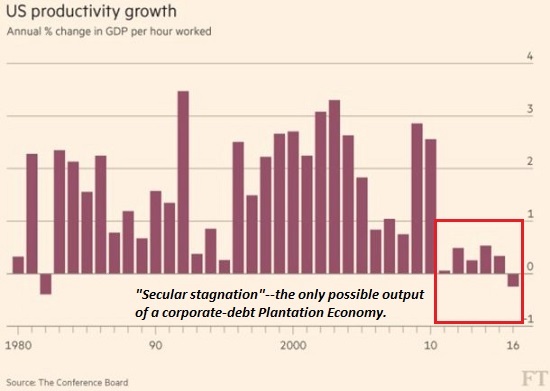 All we need to do to escape a “soft patch” (recession) is for governments to borrow and spend more money to temporarily boost incomes and demand until the private sector gets back on its feet and starts borrowing and spending more. To help the private sector, central banks lower interest rates so it’s cheaper to borrow and spend. As soon as the private-sector borrowing and spending rises, we can raise interest rates and trim state fiscal stimulus (i.e. governments borrowing and spending trillions more than they did before the recession). But the inconvenient reality is these Keynesian policies no longer work. Fiscal stimulus (governments borrowing and spending trillions more than they did before the recession) has continued for a decade–or in Japan’s case, almost three decades. The Keynesian gods have failed, but the worshippers of these false idols have no other form of black magic to turn to. Why is fiscal stimulus now a permanent policy? The answer is uncomfortable: if fiscal stimulus is withdrawn (or even trimmed), the economy immediately goes into a self-reinforcing contraction. As for near-zero interest rates: after 10 years of supposed “recovery,” central banks are terrified of pushing rates higher by quarter-point baby-steps, for the same reason that fiscal stimulus cannot be withdrawn: raising interest rates to historic norms would immediately send the economy into contraction. So “emergency” temporary measures are now permanent life-support, lest the comatose patient expire once life support is removed. If unprecedented “emergency” measures are now permanent props required to keep stagnation from imploding into depression, then what policies are left to deal with the next (inevitable) downturn? 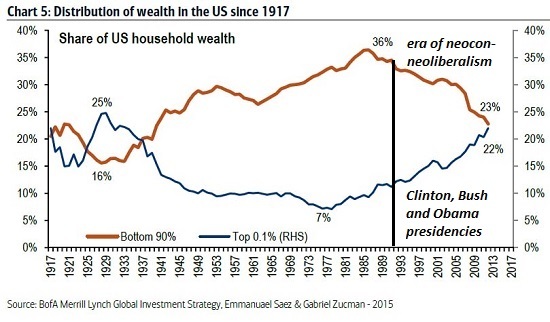 The problem with zero-interest rate policy (ZIRP) and fiscal stimulus is neither are remotely connected to real wealth creation, i.e. increased productivity.Printing /borrowing more money into existence does not create wealth; all the new money only increases future claims on existing productive assets. Real wealth is generated by increasing the output of goods and services with fewer assets, less energy and less labor. Corporations have foregone investment in favor of stock buy-backs. 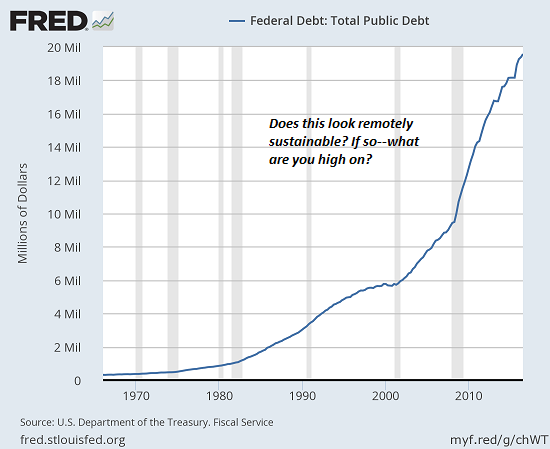 Much of the borrowed money has gone into unproductive housing and other asset bubbles. As Gail Tverberg has explained, there is a collar on oil prices: if they’re too low, producers lose money and shut down higher-cost wells, crimping supply; if they’re too high, low and moderate-income households can no longer support the consumption the economy needs to keep expanding: Why We Should Be Concerned About Low Oil Prices (Our Finite World). Cheap, abundant energy is required for expansion of borrowing, consumption and payrolls; as energy costs notch up, wages and consumption stagnate. 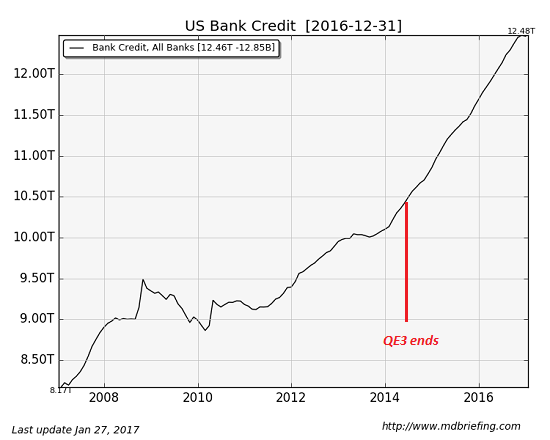 In effect, the conventional state/central bank policies reduce down to one simple directive: borrow from the future until “organic” (i.e. not dependent on state stimulus, self-sustaining) growth of the private sector returns. 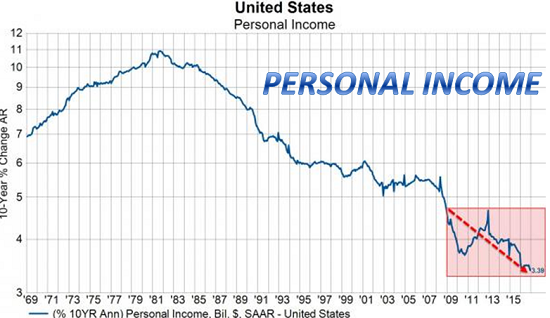 But since productivity and average wages have declined, self-sustaining expansion is no longer the norm. Instead, every sector is borrowing from the future just to maintain the illusion of solvency and expansion. Corporations, states, central banks and households are all living off money borrowed from future earnings and taxes, or spending the gains from unsustainable asset bubbles. The economy no longer works, and the Status Quo has no Plan B. All the Status Quo has is policies that no longer work: lowering interest rates (10 years and counting), fiscal stimulus (10 years and counting) and monetary easing/stimulus (10 years and counting). We sense the economy is no longer working as it did in the past, but we’re too terrified to even admit this. Since there’s no conventional fix, our “leadership” acts as if everything is just fine, and authorities “adjust” measures of stagnation to appear healthy to support the illusion of solvency and expansion. There’s no Plan B for a state-corporate form of central-planning capitalism that is no longer functioning. The only policies available are the “emergency” ones that are now permanent life-support systems of our failed global economies.